Pretzel Logic 8 piece line up, perform the hip songs of New York’s Steely Dan. The current set-list features classics such as Peg, Haitian Divorce, Josie, Deacon Blue, Reelin in the Years. With the Dan having an expansive catalogue of songs, Pretzel Logic is always expanding their repertoire. Each gig is incomparable. Steely Dan (also known as The Dan) are known for their musical perfectionism in the studio and Pretzel Logic captures this element in a real-live setting, packed with irresistible grooves, bodacious harmonies, sleek subversive lyrics, blazing solo work and a rich ensemble exploring the Jazz, Funk, Rock and R&B groove of the Dan. 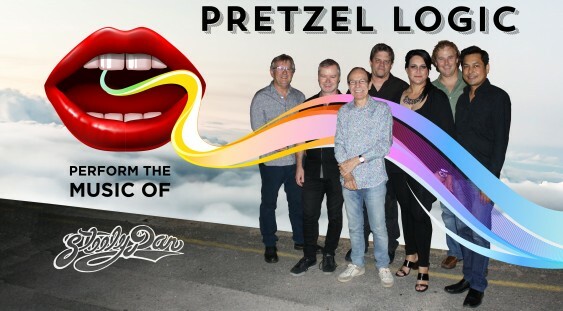 The Pretzel Logic band is firing on all cylinders with their enigmatic and unique arrangements of songs, creating a cascade of colour with their infectious tunes.